Hey mister, where can you find waves around here?” That’s the question I hear nearly every time I’m loading or unloading my standup paddleboard (or SUP for short) at one of our local beaches. I explain that you don’t need waves; you stand on top of the board and paddle it. Then the questions come in a fury: “Is it hard? Do you need to have great balance? Aren’t you afraid of sharks?” I smile and answer all the question that come my way. No it’s not that hard; you don’t need great balance, especially on the calm water in the bay; and I’m not afraid of sharks, because if you’re going in the water… there are going to be sharks. It’s unavoidable – whether you’re swimming, kayaking, or paddleboarding – it’s the ocean and we’re simply guests in their home. Why do I take the time to explain all of this? Because paddleboarding is my passion. I absolutely love it and want everyone I encounter to get out and try it! One of my favorite places to paddle is here in the historic ONE, it’s just a two-minute drive down to North Shore Beach, and I can launch right there next to the sand volleyball courts. The bay right outside our front doors is one of amazing diversity and one of the most spectacular places to paddle in all of Tampa Bay. I’ve encountered pods of dolphins flying past me, seen families of manatees feeding on the plant life of the flats, and been surprised by giant loggerhead turtles, huge schools of rays, an abundance of juvenile bonnethead sharks, and even tiny seahorses. The Bay is so rich with life and yet sometimes so calm it nearly has the clarity of an aquarium. How could anyone not want to be out there? Now that I’ve enticed you with stories of the Bay, how can you get on the water and do it yourself? There are many options available for getting out there here in the ONE. Although I’m a strong advocate for paddleboarding, I’m an even bigger fan of just getting on the water, period. Have a kayak? Fantastic. Get out there. Maybe a friend has a canoe they don’t use. Borrow it and explore the Bay. Want to try paddleboarding? Rent a board, get a lesson, and start your adventure; you’ll be hooked. It’s so easy that with a quick search on the internet you’ll find a shop that rents boards right here in northeast St. Pete. If you own a board or a kayak, even better. Come out on Tuesday night, as there’s normally a group of paddlers meeting at 6pm at North Shore Beach for a relaxing paddle. Remember to stay safe and always carry the requisite gear. 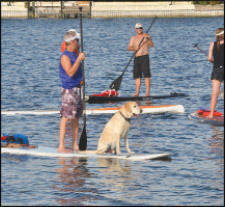 You can find what the law requires at www.myfwc.com/boating/regulations/paddleboard. 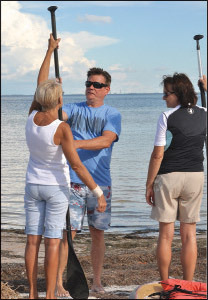 During a recent paddleboard/kayak meet-up, I had the pleasure of speaking with St. Pete native and waterman extraordinaire, Jon La Budde. He’s been an avid fan of the St. Pete waterfront since his early childhood days when North Shore Beach was referred to as 10-Cent Beach, so named because you had to pay to get through the turnstile to access the beach. Jon spent his adolescent years sailing the Bay, fishing Coffee Pot Bayou, and diving the pier for stone crab. In 2009, he started standup paddleboarding the same flats that so many of us enjoy today. As a local proprietor who has set so many people up with their first paddleboards, I asked him what is the single biggest piece of advice he could give to beginners. His response, “get some instruction on paddling technique.” I couldn’t agree more. Learning the correct way to paddle can make a world of difference by increasing the amount of time you can spend on the water before you fatigue. 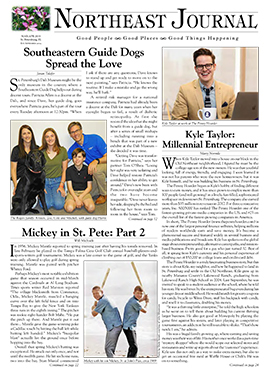 Jon was able to sum up how lucky we are to live in St Pete, commenting, “We are able to experience a vibrant downtown in one moment, and in the next moment be paddling and swimming with the manatees only a few steps away.” We are truly lucky. By exploring the Bay, not only can you get exercise and be on the water, but you’ll find a whole new view of the city you love. There’s something truly magical about paddling at sunset on the Bay. It reminds me that we call paradise home. Happy paddling, my friends! See you on the water!